Ep. 3: Steven Mitchell – Blue Rain World | Aimee J. Many people want to be the CEO of their own thing. That’s OK. It’s actually a great thing. Steve Mitchell is one of the people who wanted that, but not at the expense of relationships and collaboration. His company, Blue Rain World, works to collaborate with other companies and people to make the products and causes they support successful, while providing opportunities for more than just his company. 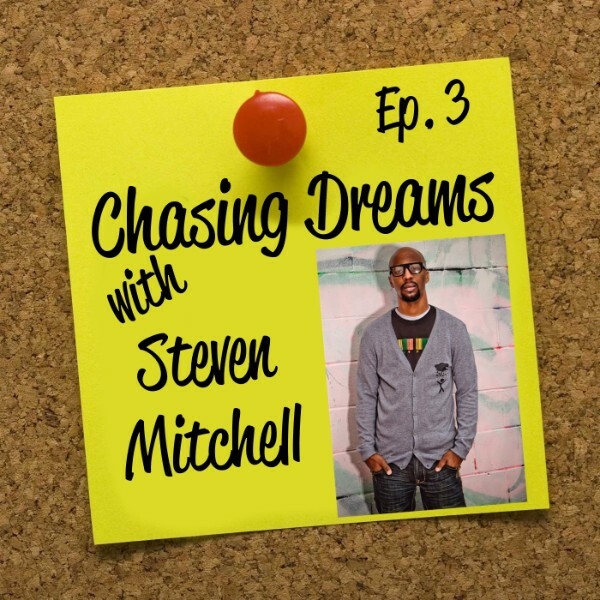 You’ll get to hear a lot more about Steve and his vision for producing valuable products and making a difference in the world at the same time, on this episode of Chasing Dreams. Your past does impact your present, but it doesn’t have to impact your future. Steve Mitchell knows the powerful pull and impact of the past. He grew up in a very poverty-stricken environment and as a result had what he calls some “mindset” issues that held him back from believing that he could accomplish anything worthwhile. Steve didn’t believe that he had what it took. He didn’t believe that someone with his background was good enough or talented enough to do big things. He had to step beyond those pains from the past, to push toward his dreams in spite of them. It’s a lesson many of us need to learn, and Steve will inspire us in that direction, on this episode. Making the transition from part time bootstrapper to full time entrepreneur. Steve Mitchell was working hard to make his dream become a reality, on a part time basis. He believed that if he put as much work into the dream on a part time basis as he did into his part time job he was working to support himself, he’d be able to move his dream to a place that it could support him. So he got to work. It wasn’t easy. It took a long time. But Steve was able to move into a full time position, running his own company, and hasn’t looked back since. What is your part-time dream that you would love to work on full time? You can do it just like Steve did, and you can get some great inspiration from Steve’s story by listening to this episode. When chasing your own dream, how do you deal with the fact that there’s no safety net? Part of the appeal of a 9 to 5 job at an established company is the predictability of the paycheck, the health care benefits, the reasonable security that the regular employment provides. But Steve Mitchell didn’t feel that way. He was working for an established company, doing stuff that was pretty fun, but realized that his time there was limited when he was called into a supervisor’s office. The things he was corrected about showed him that his level of creativity and vision was outpacing the company he worked for. That’s when he decided that he had to step out into his own business. Hear Steve’s story and find out how his company, Blue Rain World is not only producing clothing but also changing the world with its efforts. Making a difference in communities and for causes all around the world. Steve Mitchell believes in giving back because he remembers the poverty he came out of and the terrible impact it can have on people who are stuck there. Blue Rain sponsors events to raise awareness, as well as immediately addressing issues in the world today. The #Erase campaigns also focus on “Erasing” certain diseases, stereotypes, social issues, etc. through various charity events. The company even has mobile teams that travel to different communities throughout the world, providing resources for those in need. They provide food, clothing, and love to the people of the community, reaching out to give back. Find out more about Blue Rain World’s charity events and activities, on this episode of Chasing Dreams, with Aimee J. [1:38] Introduction of Steve Mitchell, founder of Blue Rain World. [2:42] Steve’s story and how Blue Rain Productions and Blue Rain Wear. [3:28] How Steve pursued his dream at the age of 21, even though he didn’t think he could do it. [6:01] How technology has impacted the way Steve leads and manages his company. [8:14] Where did the name “Blue Rain” come from and why did Steve choose it? [9:22] A conglomerate of companies that work alongside each other. How does Steve manage the administration and flow of things? [11:40] The goal of turning around some social ills and world issues. [12:58] The effect poverty had on Steve’s self image and how it motivates him to help others who are stuck in difficult situations. [16:17] What’s ahead for Blue Rain? [18:36] How Steve moved from part-time entrepreneur to full time business owner. [21:51] Why the biggest critic Steve had was himself, and what he did about it. [23:30] Steve’s suggestion to anyone wanting to believe in their ability to do something worthwhile: See it. Believe it. Do it. [24:55] Dealing with the lack of a safety net when stepping into your own entrepreneurial work. [27:19] The varying ways a “safety net” can help you while you’re moving toward the creation of your dream. [28:01] Steve’s advice about seeing your idea come into reality… and how you can work it as much as you could work a part time job. [31:10] The either / or game. Aimee asks Steve to play word association… and it turns out to be a great way to learn more about how this incredible man thinks!